Well, the long and short of it is we don’t use a set curriculum. At least not yet. In the beginning it was a lot of trial and error to find a rhythm and schedule that worked for everyone. I tried my best to create an inquiry-based learning environment. Instead of being the teacher, my goal was act as more of a facilitator in my 5-year old’s learning. Each week or two I would ask her what she was interested in learning about and we would form her lessons around that topic of interest. I did use Oak Meadow as a guide in the beginning (like this sample lesson plan) even though we don’t formally subscribe yet. It’s a resource I’m considering if we decide to continue homeschooling into first grade. I also used a printout of the kindergarten standards for our state, which was given to me by her teacher along with a few other materials for literacy and handwriting. These weren’t the forefront of my lesson planning, but more of a checklist that I would look at from time to time to make sure we were covering our bases. Lessons are typically in the morning after making our bed, getting dressed, and eating breakfast. Call me old-fashioned, but I always feel like that’s a good way to start the day. Getting dressed sometimes means a jazzy leotard and rainboots, but wearing whatever you want is a perk of homeschool life. Every day we start with the same song, “Good Morning Dear Earth” from A Child’s Seasonal Treasury. I found that singing the same short little song first was a good way to transition into our lesson time. After our song, we talk about the date and what the weather is like outside, I recite a poem that was chosen for the week, and then we start our lesson for the day. A lesson will take anywhere from 20-35 minutes. On Sunday evenings I sit down and plan out everything that we’re going to do for the week on a chart (pictured above). The number in parentheses is the number of times we devote attention to that subject each week, but most of the time many of the prompts and activities apply to multiple subjects. Whatever the topic of interest is that week, I create or research activities and prompts around that interest in the various subjects and write them in the chart. I also write down books she’s read or we read aloud and whatever pages she’s working on in her workbook. 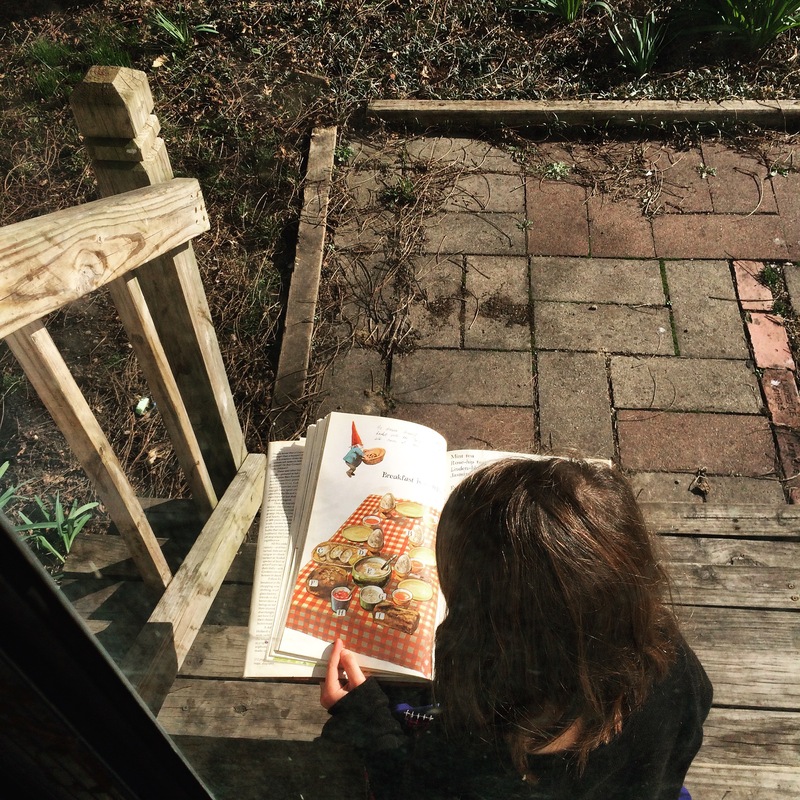 Even though I had hoped to stay away from workbooks, she really loves using them– Especially these Brain Quest workbooks and the Handwriting Without Tears workbook her kindergarten teacher gave us when started homeschooling. At the bottom of the chart, you’re probably wondering what the heck is “Neighborhood Time”? Well, it’s loosely based off of a library program my brilliant friend Cat Levinson created. She would show an episode of Mister Roger’s Neighborhood and then after they watched the show or clip, the kids would engage in an activity that relates to the show’s topic. 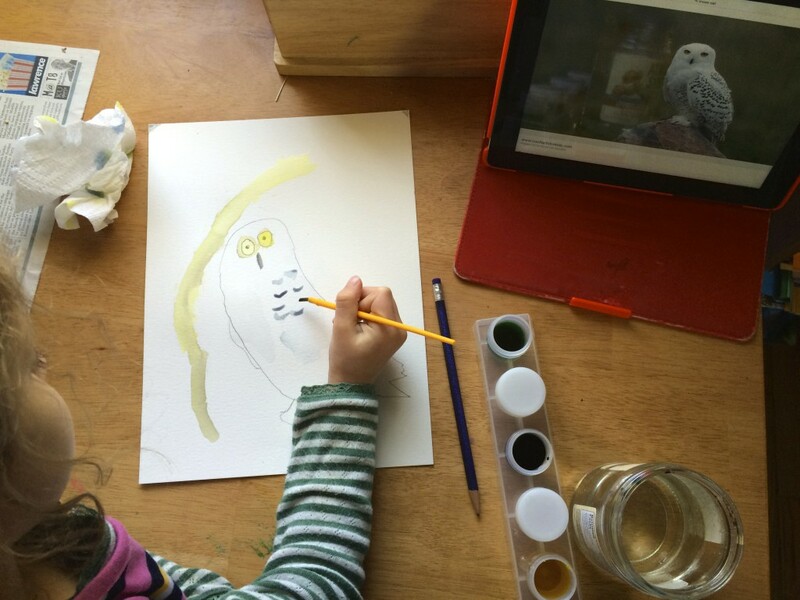 I adapted that concept for homeschooling by showing my daughter an episode that usually relates to something we’re working on that week and then we discuss the episode or participate in an extension activity based on the concepts presented. This has been a wonderful platform to address social emotional topics. Even as an adult, I find watching Mister Rogers has a calming effect and I learn so much from him. The late morning or afternoon is spent outside. We are outside ALL THE TIME. 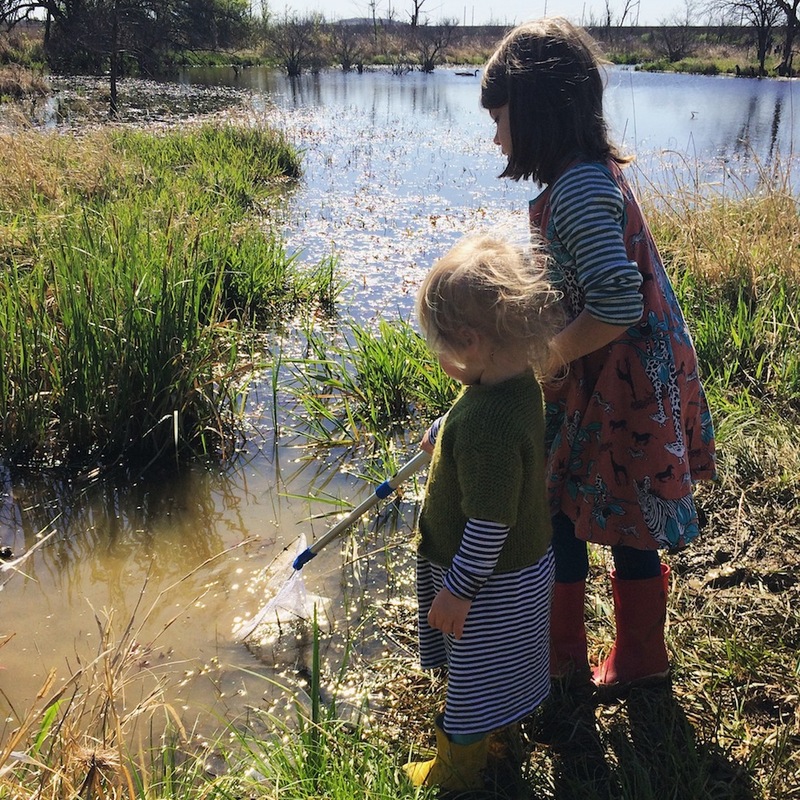 We go to the park, we go to the woods, we walk along the prairies, we splash in the wetland. Snow, rain, wind, or sunny skies we try to get outside and explore every day. She also attends 1-2 classes each week outside of home such as piano, ballet, swimming lessons, etc. What else… Oh yes. We read a lot. There are books in every room of our little house. We sit and read together at least once a day and also spend quite a bit of time at the library. Books are just a part of our everyday fabric. After lunch, the afternoons are devoted to either Neighborhood Time, free play, resting, free art time, or “project work“. Project work, also called “project time” in our house, is a time set aside for free, unstructured learning. Her 2-year-old sister loves to do all of this with us. I give her her own special lessons to perform while her sister is working. These “lessons” are usually coloring, Playdoh, Magnatiles, blocks, or assembling a puzzle. Sometimes we have lessons in the afternoon too while little sister naps, but for the most part we stick to mornings. Sometimes we don’t get to everything. Sometimes we do. Sometimes a kid is sick and there goes the day. If there’s one thing I’ve learned, and continue to learn, from homeschooling, it’s to be flexible. 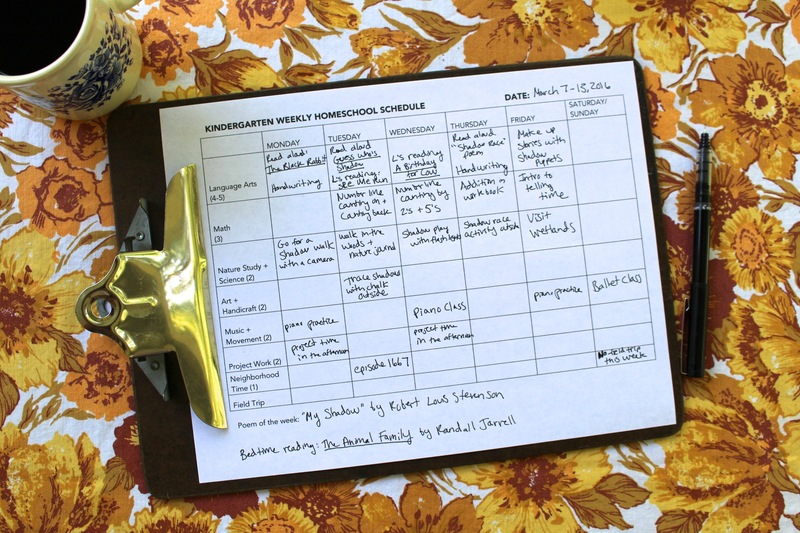 I started out planning our schedule a wee bit obsessively when I started homeschooling. I was reading as much as I could about homeschooling and wanted to make sure she was meeting all the standards her peers were learning in school. I had her journal once a week and I assembled pictures of her week along with the journal, but the truth is it was exhausting. What I learned the most about our months homeschooling was we could cover most of the material we needed to in one 30 minutes session. I stopped planning like a maniac. Now, it takes me maybe an hour to plan the entire week if I’m feeling ambitious. The internet is my most favorite co-teacher and I’m so so so grateful for all the educators and institutions that provide free resources. I’ve also found Instagram to be a terrific source of inspiration as well. If you’re interested in homeschooling or learning a little more about how we balance our home/school life, below is a list of resources that I found helpful in our homeschooling adventures. Only the first couple of the books are actually about homeschooling, but all helped me in finding a new rhythm for our homeschool life. The last book is actually a picture book that my daughter felt she could identify with as a homeschooling kid. If you have any recommendations, I’d love to know what they are! Oh fascinating!!! 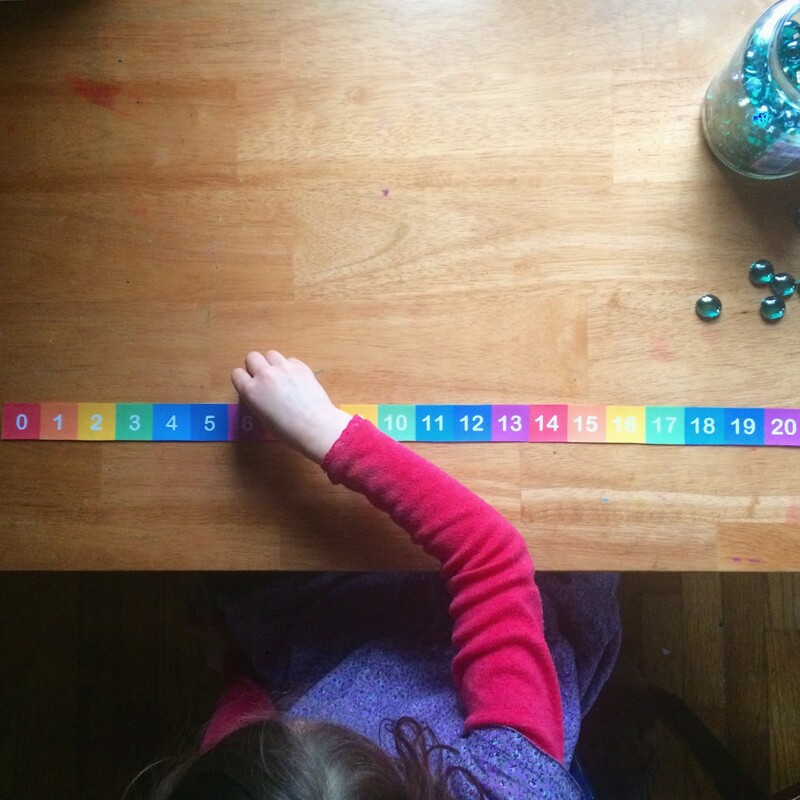 I’ve always been so intrigued by the concept but since my kid is an only kid, I always thought 1) we’d kill each other and 2) she would suffer socially and 3) MATH, ack. 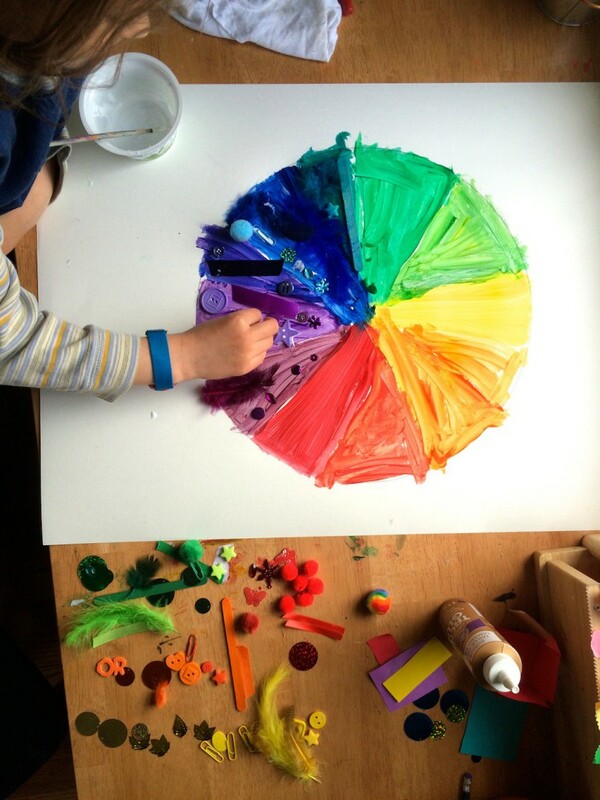 I so admire the idea, and I love the idea of learning in a child directed fashion. I’m so excited to see how you document your journey!